We’ve all read stories in the newspaper about the recent pollution problems in Lake Okeechobee, the continued degradation of Florida’s iconic springs, water wars between Florida, Alabama, and Georgia over the Chattahoochee River, and continuing issues of water flow in the Everglades. 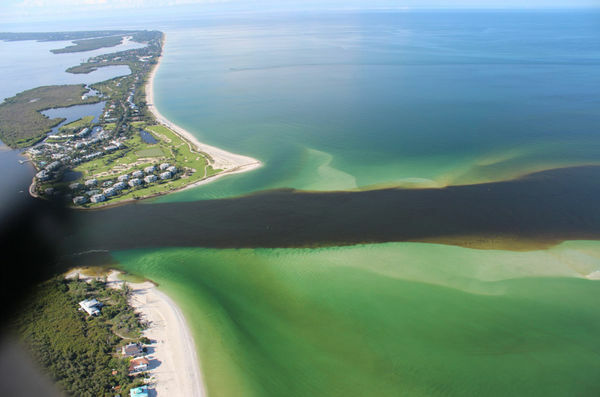 The picture above shows the troubling state of affairs at Redfish Pass in Southwest Florida this summer. Could historians, writers, and artists help solve some of these increasingly intractable water problems where science and engineering has failed? That was the question raised in the spring of 2012 when Professor Chris Meindl, director of the Florida Studies Program at USF St. Petersburg, invited a contingent of experts from Gainesville to the St. Pete campus to participate in an evening-long policy forum and conversation about water and the humanities in Florida. Two UF historians, Professor Jack Davis and Senior Lecturer Steven Noll, along with author (and UF history MA grad) Cynthia Barnett, nature photographer John Moran and painter Margaret Ross Tolbert, joined other Florida authors, artists, academics, and politicians (including former governor Bob Martinez) on a panel to discuss how the humanities could inform the discussion surrounding the state’s water crisis. They talked about whether in these divided times, a humanities-based perspective could help bridge gaps between Democrats and Republicans; liberals and conservatives; business-centered groups and those favoring the environment and give informed answers to Florida’s contentious water problems. Check out video of the proceedings by clicking on the more tranquil picture of Ginnie Springs below and tell us what you think.